The OHJA Medal Finals competition is hosted each year near the end of the horse show season. In addition to the jumping competition, all Medal Finals participants must complete a written test, the results of which count toward the final score of each competitor. Preparation for the Medal Finals is crucial to success! There is a written portion to the finals. Visit our Prepare/Study page for more information. The OHJA Medal Finals is one of OHJA’s major fundraising events. 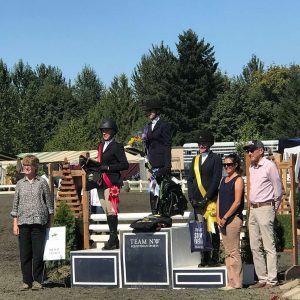 Members are encouraged to sponsor or donate to support the Medal Finals competition, and to encourage outside sponsorship from businesses that support Oregon’s hunter/jumper community. For local system riders needing financial assistance visit this page. The OHJA is an IRS 501(c)(3) non-profit charitable organization and donations are tax-deductible to the extent allowed by law; please consult with your tax adviser for more information.